First a quick synopsis: Heart of Darkness by Joseph Conrad is the story of an English boat captain (Marlow) who, in the late 19th century, makes his way up the Congo River into the African interior in search of a European ivory trader (Kurtz) who has been willfully accepted by the native Congoan people and has apparently gone mad. The story is about the captain's harrowing journey through nearly impenetrable and unexplored tropical jungle and his encounters with the native people, as well as non-natives who were also in the region for various reasons (namely the search for ivory). 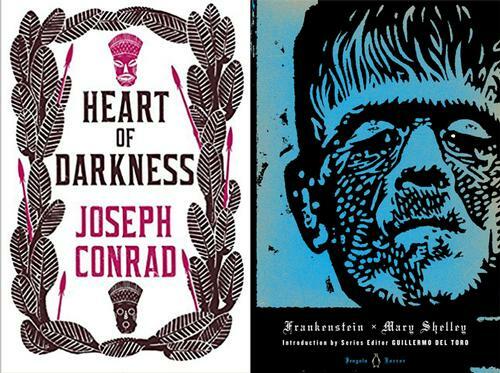 For me, re-reading Heart of Darkness was sort of a reflection on re-reading books in general. In fact, now that I think about it, maybe I never really read Heart of Darkness to begin with. Did I? Maybe I am remembering, instead, the half dozen times I've seen Apocalypse Now, the Francis Ford Coppola movie set in the Vietnam era that is based on Heart of Darkness. And maybe, the replaying of Marlon Brando uttering, "The horror! The horror! ", is something so present in my deep memory that I utter it every time I open the laundry basket (which I do). But it wasn't Brando playing Kurtz deep in Cambodia in the 1960s who said it first; it was Conrad writing for Kurtz deep in central Africa in 1899. A couple of years ago I re-read Frankenstein, which I have no memory of reading the first time, and perhaps never did. Yet I've always known what it's about. I have images in my mind about what it looks like and what happens to the monster, which I'm sure is also because of film and television—even cartoons. It never actually occurred to me to read this classic story again because it was relegated, probably incorrectly, to the "books I've already read" shelf. But I did re-read it, and it was worth it. The story of the monster and the questions of science and ethics around his creation are still so relevant. The same is true for Heart of Darkness. Like Frankenstein, Heart of Darkness is perpetually contemporary, which is why it was adapted for film by Coppola in 1979 and why it could be adapted again nearly 120 years later. There will always be a metaphorical river to traverse in search of a mysterious, mad figure in the depths of the unknown. Whether that river is in central Africa, Cambodia, or elsewhere, is only reflective of the relevant issues of our time, our present-day anxieties, and what is unknown to us (and therefore frightening or unsound). Check back each Thursday throughout the summer as we re-read and reflect on our old favorites! 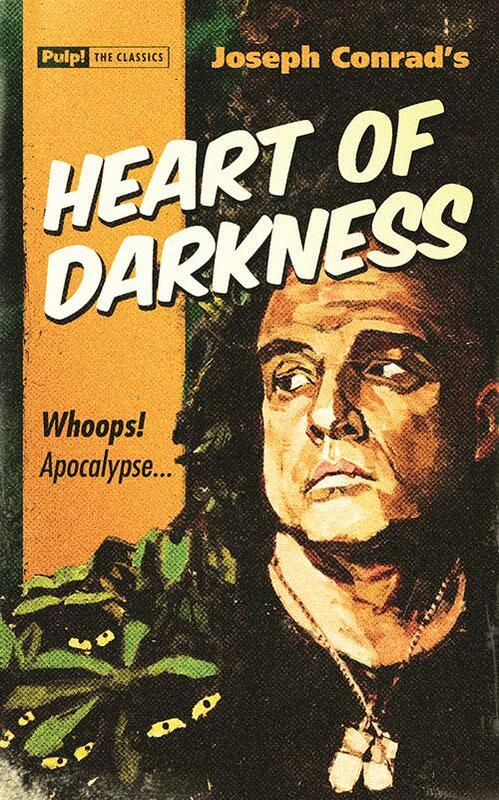 This Heart of Darkness / Apocalypse Now mashup is from Pulp! The Classics, a new imprint that gives the nation's favourite classic novels original retro covers in a pulp fiction style.